Posted on July 14, 2014 by Mark Pajor. The most successful engineers are driven by passion. This passion can be fueled by an engineer’s ability to pursue projects of his or her own choosing. Successful senior design projects and award-winning inventions make it clear that, given the chance to choose their own projects, ECE ILLINOIS students can achieve remarkable things. In order to facilitate this student ingenuity, ECE ILLINOIS is introducing a new lab in the ECE Building: the Open Projects Lab. “The Open Projects Lab will be an area where students can run their own projects that are not related to classes,” said ECE Professor Erhan Kudeki, who is coordinating with ECE student groups to determine how the lab will operate. The lab will meet the needs of both short-term and long-term projects by having two sections. In the walk-in section, ECE students can stop by and use workstations with computers and measurement instruments. Students with longer-term projects can write proposals to use the long-term space, which a student jury will review. Kudeki noted that since the lab isn’t tied to a specific course, students have the ability to pursue more risky and ambitious projects. They have access to the lab without having to worry about finishing their project by a specific deadline. 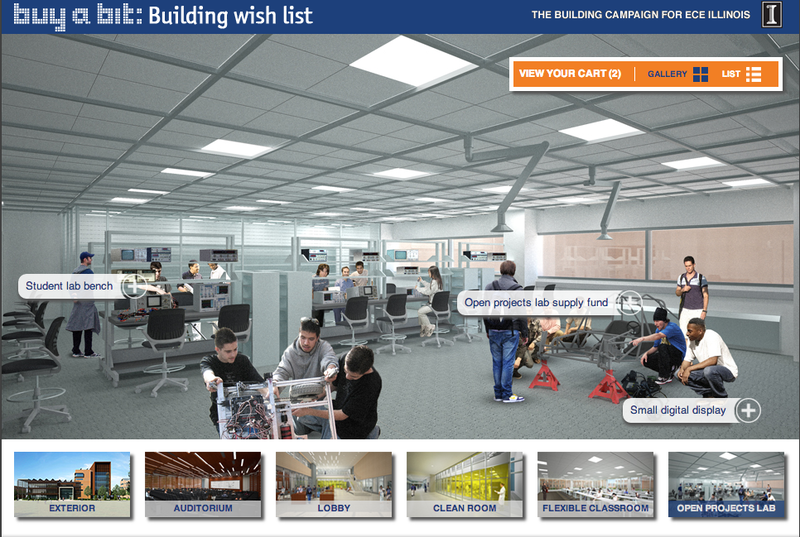 A rendering of the Open Projects Lab. The lab will also serve as an ideal space for student events. Large-scale events and competitions, like ECE PULSE and HackIllinois, will use the lab as a space for students to prepare their projects. ECE student groups will be able to use the space to organize more frequent activities. The Open Projects Lab will complement ECE’s other labs in their aims to encourage student creativity. The Srivastava Senior Design Lab provides a space for senior projects, and the final design challenge in the ECE 110 Lab is allowing for more student creativity. The Open Projects Lab takes this one step further, providing a space for independent and self-driven projects. Kudeki said that he anticipates all sorts of projects being pursued in the open lab. Interested in supporting this unique space and the students who will innovate here? Donors can make a difference with any sized gift. Opportunities ranging from in-kind gifts, to support for student projects, to room naming opportunities still exist. Contact Steve George, ECE senior director of advancement, at steveg@illinois.edu or (217) 244-8023 to learn more.